SPACIOUS 3000 SQUARE FOOT FACILITY LOCATED ON BUSH RIVER ROAD IN COLUMBIA, SC. This total step, to purchase and remodel this facility was taken for $199,000. An added blessing occurred; when all national offices and storage costs were consolidated, the ministry overhead was lowered again!! The "Bush River Project" is a faith endeavor which, when completed, will allow us to operate with a "utilities only" monthly cost!!! 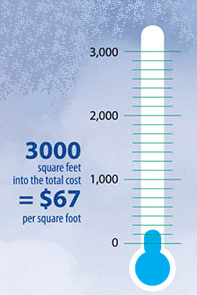 it is a simple plan that divides the 3000 square feet into the total cost - equaling $67 per square foot. Each friend and partner is asked to prayerfully consider providing for one or more square feet. A word of caution; what we are doing nationally through the "Revitalization of Churches" in America and internationally through "The Witness Project" cannot suffer. Therefore, as we give to this endeavor, it must not be taken from our support of these ministry soul winning and outreach areas. As a friend and partner, each month you will be given an update in your monthly "Partner's Report." By faith, we are trusting that all 3000 square feet will be provided in the next 24 months. Each friend and partner is asked to prayerfully consider what they can do. Your gift can be given as a one time gift or monthly, as you desire. It can be by check, credit card or online. You can give online at the link below.